Over 50 church leaders and hundreds of worshippers gathered at the HOPE Nottingham launch event on 14th October to share their vision for their city and commit to working together more. Roy Crowne, Director of HOPE Together and Steve Clifford, Director General of the Evangelical Alliance commissioned Nigel Adams as Director of HOPE Nottingham and affirmed the whole team at the launch. Nigel is now leading the newly registered charity full time. The event provided opportunity for participants to share ideas and dreams on how the churches can work together better and do more effective mission through words and actions. Nigel Adams, Director of HOPE Nottingham said: “Celebrating the success of what we have already achieved together as HOPE and looking forward to a new phase of working across denominations, was hugely encouraging. The official launch marks a significant point for HOPE Nottingham, grown out of NG9, three years on from initial sparks of excitement at a small prayer meeting with a few local leaders. HOPE Nottingham now consists of a network of volunteers from different churches in the area and is developing the HOPE model across the city. HOPE this year has already seen a small soup kitchen expand in order to serve more homeless people. A new HOPE café and drop in centre uses an old URC church building and upstairs now houses the HOPE Nottingham office. Small stalls offering prayer at summer festivals have developed into Healing on the Streets (H.O.T.S). Through HOPE, the Healing teams now minister every Saturday in the centre of Beeston and there are plans to develop in other parts of the city. Roy Crowne said: “Meeting with Nottingham leaders has been such a privilege. This group of people are really getting to the essence of what God is asking them to do on their patch – to share His message through words and actions. Parts of Nottingham were hubs of outreach activity during HOPE 08 with a large number of joint projects, gardening, holiday clubs, an art competition, an outdoor passion play and HOPE in the park event. 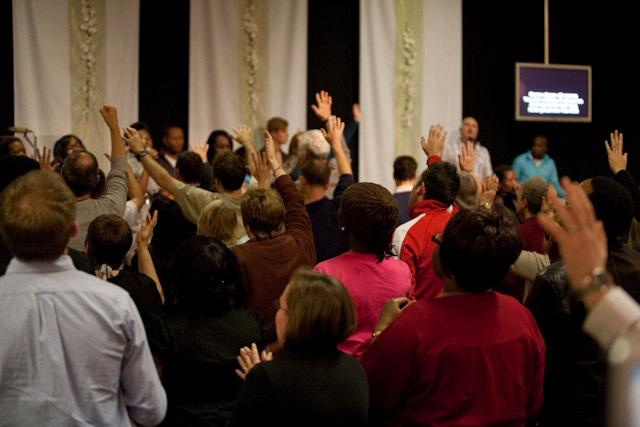 HOPE Nottingham is currently making plans for a large central prayer celebration at Pentecost in 2011 and a road show which would visit each community to bring local Christians together, help them fully engage with their neighbourhoods and feel part of the larger HOPE initiative. HOPE Nottingham aims to unite local Christians in mission, enable positive relationships between churches and with other community leaders and mobilise sustainable projects that create lasting transformation. HOPE Nottingham is part of HOPE Together which is the national initiative launched this July as a continuation of HOPE 08. HOPE Together aims to help local churches work together and build on mission activity to become even more outward looking over the next four years, leading toward an all-out year of mission in 2014.